More than 70 years ago, the M.I.T. electrical engineer Harold (Doc) Edgerton began using strobe lights to create remarkable photographs: a bullet stopped in flight as it pierced an apple, the coronet created by the splash of a drop of milk. 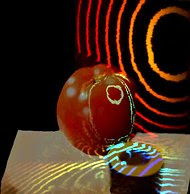 Now scientists at M.I.T.’s Media Lab are using an ultrafast imaging system to capture light itself as it passes through liquids and objects, in effect snapping a picture in less than two-trillionths of a second.